Postsecondary students [студенти; studenty]. From the mid-14th century on, before there were universities in Ukraine, Ukrainians studied at European universities, particularly at Cracow (800 were educated there in the 15th and 16th centuries) and Prague (there was a special residence for Lithuanian and ‘Ruthenian’ students there). They also studied at the universities of Heidelberg, Leipzig, Königsberg, Göttingen, Köln, Wittenberg, Halle, Kiel, Vienna, Paris, Strasbourg, Basel, Leiden, Oxford, Rome (theology students), Padua, and Bologna and at Polish Jesuit academies and colleges in Poland, Ukraine, Belarus, and Lithuania. The first postsecondary school in Ukraine was the Orthodox Kyivan Mohyla Academy (1632–1817). Its students—the sons not only of nobles, the Cossack starshyna, and clerics but also of rank-and-file Cossacks, burghers, and peasants—had few liberties or prerogatives and were subjected to strict supervision and discipline, including beatings and various humiliations. Such treatment did not, however, deter them from engaging in petty theft, drinking, brawling, and even terrorizing and robbing townsfolk. In the 17th century the academy rarely had more than 200 students. By 1710 their number had grown to over 2,000, but then it declined to 1,100 in 1715, not more than 800 in the 1720s and 1730s, and approximately 1,100 from 1744 to the 1770s. Most of the students were from outside Kyiv. In the second half of the 18th century they hailed primarily from within the Hetman state. Only those from rich families could afford private quarters, and they were treated with deference by the administration. Many (200 in the early 18th century, nearly 400 in 1765) were poor and received room and board in the academy's bursa, and others resided with parish priests and elsewhere in Kyiv (see Bursas and student residences). Their meager incomes derived from begging door to door, appearing in public choral and theatrical performances, and serving as precentors, parochial school teachers, and servants and tutors to the rich. Those who belonged to the academy's Young Brotherhood and, later, two sodalities were instilled with an Orthodox zeal, and aided their needy peers. From 1701 on, Orthodox Ukrainians from Polish-ruled territories, Russians, Serbs, Bulgarians, and even Moldavians, Wallachians, and Greeks were allowed to study at the academy. In the second half of the 18th century the largest group of students were the sons of priests and clerics. Ukraine under Russian rule, 1805–1917. Increasingly more students received higher education in Ukraine after the opening of Kharkiv University (1805), the Kyiv Theological Academy (1819), the Nizhyn Lyceum (1820), Kyiv University (1834), the Richelieu Lyceum in Odesa (a postsecondary school from 1837), and Odesa University (1865). Many postsecondary professional and technical schools were opened in the second half of the 19th century, and many postsecondary schools for the education of women arose after the Revolution of 1905. In 1914–16 there were 26,700 students in Ukraine: approximately 10,000 at universities, 13,000 at professional and technical schools, and 4,000 in higher courses for women. The rights and obligations of students in the Russian Empire were defined by a general statute on universities. The 1804 statute formally guaranteed self-government to universities and academic freedom to students. The 1835 statute that replaced it put universities under the supervision of trustees and the political conduct of students under the control of university inspectors. In 1845, to restrict the non-gentry's access to higher education, the state raised tuition fees. In 1847 the right of unregistered persons to audit lectures was withdrawn. In 1863 university autonomy was reinstated, but students came under the jurisdiction of university tribunals. In 1872 the Ministry of Education responded to widespread student unrest in the empire by introducing stricter disciplinary rules, but they were not confirmed by the various university professorial councils. Subsequent student unrest, which began with a demonstration at Kyiv University on 14 March 1878 and the expulsion of some 100 students there, and then spread to other universities, resulted in the introduction of harsher governmental restrictions. An 1884 law again rescinded university autonomy, and in 1887 tuition fees were raised fivefold. In 1899 the state introduced punitive measures subjecting participants in student unrest to military conscription. The students responded with further walkouts, boycotts of classes, and demonstrations, and in 1901 the minister of education, N. Bogolepov, was assassinated. In 1855 universal access to higher education was introduced. Consequently the number of students in Russian-ruled Ukraine grew from 3,141 in 1855 to 38,853 in 1916, and the proportion of students whose parents were nobles or civil servants fell from 65 percent in 1855 to 36 percent in 1914. In 1894, of the 4,016 students at Kharkiv University, Kyiv University, and Odesa University, 59.7 percent were Orthodox (of whom half, approximately 1,200, were Ukrainians), 25.3 percent were Jewish, 12.8 percent were Roman Catholic Poles (mostly at Kyiv University), and 2 percent were Protestants. Students’ living conditions were poor. In the 1880s and 1890s fewer than 15 percent of them were exempted from paying tuition, and few received state stipends. They were all obliged to wear prescribed uniforms. Ukrainians also studied at imperial universities outside Ukraine, mostly in Moscow (20.4 percent of students at Moscow University in 1891 were from Ukraine), Saint Petersburg, and, from 1896, when the Ministry of Education allowed the graduates of theological seminaries to enter university, Warsaw, Tartu, and Tomsk. For many years ethnic Ukrainian student organizations did not exist. Instead students were active in various Russian and Ukrainian underground and semilegal organizations (eg, the Cyril and Methodius Brotherhood), in local hromadas (especially the Hromada of Kyiv), in various revolutionary populist organizations, and in the Brotherhood of Taras. From the late 19th century they belonged to general Russian student organizations, which championed academic freedom, autonomy, and corporate rights (ie, the right to have meetings, assemblies, student tribunals, and mutual aid savings banks). At the ‘all-Russian’ student congresses 23 of 98 delegates were Ukrainians. The first Ukrainian student organizations date from the second half of the 19th century, when semilegal zemliatstva, which united students from the same region studying in a particular city, were founded. Those groups chose delegates to student executives at universities and institutes. Later, clandestine Ukrainian student hromadas were created in Kyiv (1893), Kharkiv (1897), Moscow (1898), Saint Petersburg (the Ukrainian Student Hromada in Saint Petersburg, 1898), Tartu (1898), Warsaw (1901), and Odesa (1902). The involvement of many of their members in various Russian and Ukrainian revolutionary political parties brought about expulsion, police persecution, imprisonment, and even exile to Siberia. After the Revolution of 1905 the student hromadas tried to operate independently of the parties and concentrated on professional and academic activities. Consequently they were legalized, and their combined membership grew from approximately 260 at the beginning of the century to approximately 1,000 in 1908. Hromada membership grew from 22 to 250 in Moscow, from 50 to 150 in Kharkiv, from 68 to 130 in Kyiv, from 20 to 98 in Tartu, from 30 to 64 in Odesa, to approximately 120 in Warsaw, to approximately 100 in Saint Petersburg, and to 40 each in Tomsk and at the Kyiv Higher Courses for Women. The work of the student hromadas was co-ordinated by secret congresses of delegates, which were convened in Kyiv in 1898, 1899, and 1908, in Poltava in 1901, and in Saint Petersburg in 1904. In 1913 a Supreme Council of Ukrainian Students was created (it published irregularly the miscellany Ukraïns'kyi student in 1913–14). From the 1890s on, the hromadas had contacts with Western Ukrainian student organizations. Delegates from the Sich student society of Vienna and the Academic Hromada of Lviv took part in the 1898 congress in Kyiv; hromada representatives visited Galicia and Bukovyna; students from Russian-ruled Ukraine attended summer courses in Lviv and Chernivtsi; and student excursions were jointly organized. Western Ukraine under Austrian rule, 1772–1918. Western Ukrainian students attended the Barbareum Greek Catholic seminary in Vienna (1774–84) and Lviv University (est 1784) and its theological Studium Ruthenum (1787–1809), the Lviv Polytechnic (est 1814), Agricultural School (est 1855), and Veterinary Academy (est 1881) in Lviv, and Chernivtsi University (est 1875). In those institutions they made up 10–25 percent of the total number of students. Small numbers of Western Ukrainian students also studied at the universities of Vienna, Budapest, and Cracow and elsewhere in the Austrian Empire. All postsecondary schools in the empire, as elsewhere in Western and Central Europe, were self-governing. The students’ ‘academic freedoms,’ however, were subject to local government control during the period of absolutism (until 1860). Theology students were also subject to ecclesiastical sanctions. The first Western Ukrainian student organizations and the largest number of them were founded in Lviv: the populist Sich student societies (1861–3), Akademichna Besida (1870–1), Druzhnyi Lykhvar (1871–82), and Vatra (1892–6) societies; the Russophile Academic Circle (est 1870); the Ukrainophile socialist Academic Brotherhood (1882–96); the Academic Hromada (1896–1921), which arose from the amalgamation of the Vatra society and the Academic Brotherhood; and the Osnova society (1897–1939) at the Lviv Polytechnic. In Chernivtsi the initially Russophile but from 1879 Ukrainophile-dominated Soiuz society (1875–1902, 1904–22), the Russophile Bukovyna (1888–94) and Karpat (est 1894) societies, the Moloda Ukraina (1900–2) and Sich student societies (1902–23), and the Orthodox Academy's theology students’ society (1907–23) were established. Elsewhere in the Austrian Empire, Ukrainian students founded the Society of Saints Cyril and Methodius (est 1864) and the Sich student society of Vienna (1868–1947), the Academic Hromada (1887–95) in Cracow; the Rus’ mutual aid association (1895–1910) and Sich student society (1902 to ca 1947) in Graz, and the Ukrainian Hromada (1902–14) in Prague. To co-ordinate their activities the existing student organizations convened congresses in Kolomyia in 1881 and 1884. In 1889 the students first lent their support to the public campaign for the creation of a Ukrainian university in Lviv. Later they organized secret political cells and advocated Ukrainian independence in their journal Moloda Ukraïna (1900–3, 1905). An influential factor in the students’ political development was their contact with their peers in Russian-ruled Ukraine, particularly those belonging to the Revolutionary Ukrainian party. The failure of the campaign for a Ukrainian university resulted in the secession of Ukrainian students from Lviv University in 1901–2. After their return the militant struggle between Ukrainian and Polish students in Lviv became even more acute (it resulted in the murder of Adam Kotsko in 1910), and the clandestine Committee of Ukrainian Youth (KUM) was created to spearhead it. The first ‘all-student’ congress took place in Lviv in 1909 with the participation of delegates from Russian-ruled Ukraine. At the second congress in 1913, an umbrella organization, the Ukrainian Student Union, was created. Headed by Mykola Zalizniak, in 1913–14 it had in Galicia 1,786 members in 38 chapters, which conducted cultural-educational work among the peasantry and published the journal Shliakhy. The first Ukrainian student fraternities modeled on the German Burschenschaften, Zaporozhe (est 1906) and Chornomore (est 1913), were founded at Chernivtsi University. Later chapters were created in Lviv, Warsaw, Prague, Vienna, Cracow, and Gdańsk (Danzig), where they survived until 1940. Another fraternity, Roksolianiia, was created in Lviv. The students of Western Ukraine had various class origins (in the 1880s, 40 percent of them were sons of priests). Because many of those from the peasantry and working class were poor, charities, such as Lykhvar, were established to support them, and a publicly funded residence, the Academic Home, was founded in Lviv in 1907 with the substantial financial support of Yevhen Chykalenko. In 1912–13 there were 1,868 Ukrainian postsecondary students in the Austrian Empire: 1,287 studied in Lviv (constituting approximately 17 percent of all students there), 187 in Chernivtsi (16 percent; in 1914, 300, or 25 percent), 166 in Vienna, 55 in Cracow, 97 in Stanyslaviv (theology students), 28 in Peremyshl (theology students), and 48 elsewhere. Of the total number, 843 were studying law; 430, theology; 271, humanities; 129, medicine and pharmacology; 85, technical sciences; 45, agronomy; 32, veterinary medicine; 17, commerce; and 5, art. 1914–17. After the outbreak of the First World War most students were conscripted. Many Galician and Bukovynian students served in the Ukrainian Sich Riflemen and Ukrainian Galician Army. After the February Revolution of 1917, students took part in the creation of the Central Rada in Kyiv (student representatives in the Central Rada included V. Boiko, Mykola Samoilovych, Andrii Zhuravel, Yuliian Okhrymovych, Oleksander Sevriuk, M. Saltan, Mykola Chechel, and Mykhailo Yeremiiv). They became active in various political parties, particularly the Ukrainian Party of Socialist Revolutionaries, whose leadership was overwhelmingly student-based, and were involved in the Ukrainian National Republic (UNR) diplomatic corps (eg, at negotiations of the Peace Treaty of Brest-Litovsk), military, and civil service. In March 1917 a Supreme Ukrainian Student Council was formed in Kyiv. It organized three all-Ukrainian student conferences and published a journal, Sterno (1917). Students at Kyiv University formed the Student Battalion that was decimated by the Red Army in the Battle of Kruty in January 1918. 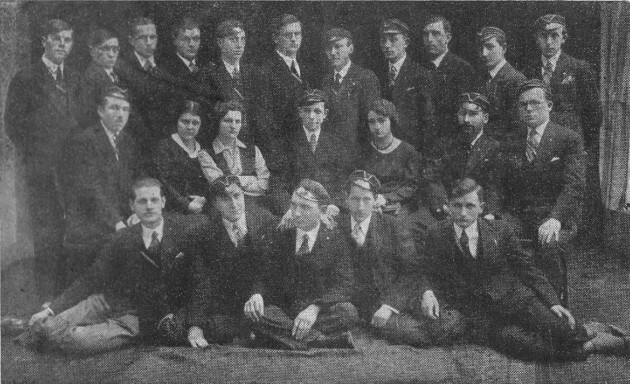 Western Ukrainian and émigré students, 1920–45. The greatest Ukrainian student achievement in the interwar period was the establishment of the Central Union of Ukrainian Students (TseSUS) in Prague in 1922. By 1924 TseSUS had 22 constituent organizations in nine countries outside Soviet Ukraine: 1,324 members were in Galicia and elsewhere in Poland; 1,442, in Czechoslovakia; 160, in Romania; 237, in Germany; and 201, in Austria. In 1924 pro-communist and Sovietophile students in Galicia quit TseSUS and created their own umbrella, the Working Alliance of Progressive Students, which was affiliated with the Central Bureau of Proletarian Students in Kharkiv, and survived until the late 1920s. In Polish-occupied Western Ukraine native Ukrainian émigrés from Soviet-occupied Ukraine encountered obstructions from the new Polish government, which allowed only Polish army veterans (thereby excluding veterans of the Army of the Ukrainian National Republic and the Ukrainian Galician Army) to enroll at Lviv University and other postsecondary schools in Poland from November 1919, abolished the Ukrainian chairs at Lviv University, and outlawed the Academic Hromada in 1921. The Ukrainians tried to overcome the impediments by attending the Lviv (Underground) Ukrainian University (over 1,500 students) and Lviv (Underground) Ukrainian Higher Polytechnical School (64 students) in 1921–5 and the Greek Catholic Theological Seminary in Lviv, and by studying abroad, especially in Czechoslovakia. They established the underground Ukrainian Provincial Student Organization, renamed the Professional Organization of Ukrainian Students (PROFORUS, 1921–5). Headed by P. Gan (also the first president of the Central Union of Ukrainian Students) and a council in Lviv, it had 10 district and 50 county branches, totaling 1,252 members in 1924. PROFORUS sponsored the Third Congress of Ukrainian Students in Western Ukraine in 1925. Students were also active in 34 student sections of local Prosvita societies. Emigrés from Soviet-occupied Ukraine in Warsaw, Cracow, and Polish internment camps established Ukrainian student hromadas in Warsaw (1921–39) and Cracow (1924–39; 300 members in 1928, 271 in 1933, and 83 in 1938) and the Union of Ukrainian Student Emigrés in Poland in 1923 (five affiliates with 157 members in 1923 and 68 in 1924). From the second half of the 1920s, after Ukrainians returned to Polish schools, student life centered around the Academic Home and the newly created Student Hromada in Lviv. The Ukrainian students in Lviv (1,506 in 1929–30) and elsewhere were divided into mutually hostile nationalist and pro-communist camps (the latter lost much of its support in 1926–7). Ukrainians also studied at Polish universities and other schools in Cracow (389 students in 1929–30), Warsaw (approximately 200 students), Poznań, Vilnius, and Lublin, where they did not encounter administrative hindrances, and established student clubs. According to official statistics on religious affiliation, under Polish rule there were 3,000 Ukrainian students in 1927–8, 2,800 in 1933–4, and 2,500 in 1937–8, not counting Greek Catholic theology students in Lviv, Peremyshl, and Stanyslaviv. Organized activity was revitalized after the creation of the semilegal, pro-OUN Union of Ukrainian Student Organizations under Poland (1931–9), which united 2,500 students at five universities and 27 societies (18 in Lviv, 5 in Cracow, 2 in Poznań, 1 in Vilnius, 1 in Warsaw) with 65 county affiliates. The students’ revolutionary activities resulted in the imprisonment of many of them during the 1920s and 1930s. In Romanian-occupied Bukovyna the Soiuz, the Orthodox Academy, and the Sich student societies were banned after 1922–3. Only the fraternities Zaporozhe (it was also banned in 1926–8) and Chornomore and their Fraternal Union (est 1929) were allowed to function. Their activity was co-ordinated by the clandestine Committee of Ukrainian Students of Bukovyna (1921–5), linked to the Central Union of Ukrainian Students. Small groups of Ukrainians studying elsewhere in Romania established new societies: Zoria (1921–6) and Bukovyna (1926–44) in Bucharest and Hromada (ca 1928 to ca 1936) in Iaşi. From 1929 to 1937 the activity of all existing student societies (totaling 160 members in 1929) was co-ordinated by the Union of Ukrainian Student Organizations in Romania. Romanian oppression, like Polish oppression in Galicia, politicized the students, who became active in clandestine nationalist and left-wing organizations, and the overtly pro-OUN Zalizniak society (1934–7) was created by former members of Chornomore and Zaporozhe. Because of discrimination many Ukrainians were forced to study abroad. Whereas in 1920 there had been 239 Ukrainian students at Chernivtsi University alone (14 percent of the student body), in 1939 there were only 80 Ukrainian students in all of Romania. Because there were no postsecondary schools in Czechoslovak-ruled Transcarpathia, Transcarpathian students (350 by the late 1930s) studied in state schools in Prague, Brno, and Bratislava, at the Ukrainian Free University (UVU) and Ukrainian Higher Pedagogical Institute in Prague, and at the Ukrainian Husbandry Academy (UHA) and its successor, the Ukrainian Technical and Husbandry Institute (UTHI), in Poděbrady. From 1921 those with a populist orientation belonged to the Union of Subcarpathian Ukrainian Students (164 members in 1931). Russophile students belonged to the Vozrozhdenie society (est 1920), which published the monthly Molodaia Rus’ (1930–1), and the Central Union of Carpatho-Russian Students (est 1927). In 1939–40 there were about 600 students from Transcarpathia studying in Czechoslovakia, most of them in Prague. In the 1920s and 1930s many émigré veterans of the Army of the Ukrainian National Republic and the Ukrainian Galician Army and Western Ukrainians studied abroad. Their largest concentration was in Czechoslovakia, where from 1921 to 1931 the state provided them with stipends, clothing, medicine, textbooks, and instruments (distributed by a Czech-Ukrainian Committee) and subsidized the Ukrainian Free University and Ukrainian Husbandry Academy. The students also received aid from the European Student Relief Fund. In 1924 there were 1,896 Ukrainian émigré students in Czechoslovakia: 1,255 in Prague, 382 in Poděbrady, 170 in Brno, and 6 in Bratislava. The largest Ukrainian student organization in Czechoslovakia was the Ukrainian Academic Hromada in Prague, which had 1,258 members in 1922 but declined to 321 members in 1923, after ideological splits resulted in the creation of the 249-member Hromada of Students from Great Ukraine (ie, Soviet-ruled Ukraine), the 222-member socialist Hromada Student Society, the 55-member Union of Student Emigrés from the Northwestern Lands of Ukraine (ie, Polish-ruled Volhynia, the Kholm region, Podlachia, and Polisia), and other nationalist, socialist, and communist groups. Dozens of other student associations based mostly on fields of study were also formed. In the early 1920s a sizable group of Ukrainians studied briefly in Austria, particularly in Vienna (there the Sich student society of Vienna fell from 327 members in 1922 to 46 in 1931), Graz (about 50 students), and Leoben (about 25 students). Most of them completed their studies at the Ukrainian Free University and the Ukrainian Husbandry Academy. In interwar Germany about 200 Ukrainians studied in Berlin, where in 1921 they formed the Ukrainian Student Association in Germany and the small Academic Hromada and Osnova society. Over 200 others studied at the Gdańsk (Danzig) Polytechnic, where they founded the Osnova Union of Ukrainian Students in Danzig (1922–45), a student co-operative in 1925, the fraternities Chornomore, Halych, and Zarevo in 1924–5, the socialist Ivan Franko Society, and the Sovietophile Drahomanov Hromada. The students in Gdańsk hosted the first Central Union of Ukrainian Students congress (1923) and published the irregular humorous bulletin Smikhomet (1923–38). Upon graduation they played key roles in the Galician co-operative movement and industry. Smaller numbers of students studied in Königsberg, Kiel, Göttingen, and Wrocław (Breslau) and elsewhere. Organizational activities were co-ordinated by the Union of Ukrainian Student Organizations in Germany and Danzig (SUSOND, 1924–41), which was reconstituted as the Nationalist Organization of Ukrainian Students in Germany (NOUS, 1941–7). Elsewhere in Europe, small numbers of Ukrainians studied in Zagreb, Ljubljana, Paris, Leuven, Liége, Sofia, Geneva, Rome, Budapest, and other cities, where they founded student societies. Societies were also founded in the United States: the Ukrainian Academic Hromada in Philadelphia (est 1923), the Society of Ukrainian Youth in New York (est 1924), the Ukrainian Student Hromada in Chicago, and, in the 1930s, student clubs in Detroit, Pittsburgh, Scranton, Cleveland, and other cities. An estimated 700 Ukrainians had received master's degrees and doctorates in the United States by 1936. In Canada Ukrainian students founded the Kameniari club in Saskatoon in 1917 (135 members in 1926), other clubs in Winnipeg, Yorkton, Brandon, Edmonton, Regina, and Toronto, and a student federation with over 400 members in 1929. 1939–45. During the Soviet occupation of Western Ukraine in 1939–41, all existing student organizations were abolished. In the Nazi-occupied countries the activity of the Central Union of Ukrainian Students was restricted, and the German-supervised Union of Ukrainian Student Organizations in Germany and Danzig and Nationalist Organization of Ukrainian Students in Germany co-ordinated the activities of 600 students belonging to the Sich student society in Vienna (200 members in 1942–3) and Graz (50 members), the Ukrainian Academic Hromada in Prague (164 members), the Mazepynets society in Berlin (91 members), the Chornomore society in Wrocław (Breslau, 27 members), the Osnova union in Gdańsk (Danzig, 20 members), the Baturyn society in Munich (10 members), and other student groups in Dresden, Leipzig, Freiburg, Göttingen, and Innsbruck. The German authorities hindered the reactivation of student life in Nazi-occupied Galicia in the fall of 1941. Nonetheless, the teaching of postsecondary professional courses was allowed in Lviv in 1942, and the Ukrainian Central Committee (UTsK) created the Labor Alliance of Ukrainian Students, which united 1,355 medicine, 441 technical science, 192 veterinary science, 184 forestry, 182 pharmacology, 121 agronomy, and 93 theology students. Student aid was provided by the Ukrainian Students' Aid Commission (KoDUS) of the UTsK in Cracow; in 1943–4 it granted 530 scholarships to students in Galicia and 213 to Ukrainians studying elsewhere in the Third Reich and Bohemia. Additional support came from the Humboldt Foundation. After Germany invaded the USSR in 1941, in the Reichskommissariat Ukraine the Nazis closed down all postsecondary schools and deported most students as Ostarbeiter to the Third Reich. In Bukovyna the Romanian regime expelled all Ukrainian students from Chernivtsi University, and in Transnistria it Romanianized Odesa University. Only in Hungarian-occupied territories were some 300 Transcarpathian students allowed to attend postsecondary schools (mostly in Budapest and Debrecen, where the Society of Ruthenian Students of Transcarpathia was allowed to function). Soviet Ukraine. After the consolidation of Soviet rule in Ukraine a new educational system was introduced. Existing postsecondary schools were reorganized into institutes and tekhnikums (transformed in the 1930s into secondary special schools), and their autonomy, student councils, and academic freedom were abolished. Access to higher education was denied persons with ‘non-working-class origins,’ and in order to register, all aspiring students had to get recommendations from the Communist Party, Komsomol, or trade-union committees. In the 1920s Soviet Ukraine's student body was repeatedly purged of those who had concealed their social origins or lacked ‘work service,’ that is, whose relatives had been repressed as political opponents of the regime, kulaks, or priests. As a result a dramatic decline in the number of students occurred (see table 1). To increase the proportion of students with proletarian and nezamozhnyky backgrounds, from 1921 to 1940 so-called workers' faculties (10 in 1921, 30 in 1925, 78 in 1929) provided workers and peasants with two years of preparatory courses. Consequently the social composition of Ukraine's students changed dramatically, from 22.5 percent working class and 20.5 percent peasant in 1924–5 to 28.5 percent and 42 percent respectively in 1926–7. By 1936, persons with working-class origins constituted 44.4 percent of all postsecondary students and 39.7 percent of all university students; those with professional-class origins, 9.5 percent and 16.3 percent; those with civil service origins, 24 percent and 28 percent; those with collective farmer origins, 19.6 percent and 12.9 percent; those with private farmer origins, 2.8 percent and 2.3 percent; and those with other origins, 0.7 and 0.8 percent. In the early 1930s all postsecondary schools were reorganized, and traditional forms of education were partly reintroduced. From 1936 less attention was paid to students' social backgrounds, and many more students received stipends. Thenceforth ten-year-school graduates had the right to pursue a postsecondary education, although the ability to pay newly introduced tuition fees limited the admission of many children of peasants and workers. Consequently, by the 1950s the children of functionaries, professionals, and Party bureaucrats constituted 42 percent of all students. In the post-Stalin period, particularly after the introduction of the 1958 law ‘On the Strengthening of the Link between the School and Life and on the Further Development of Public Education in the USSR,’ the usual prerequisite for admission to postsecondary schools was two years of ‘productive’ employment, and higher education was subordinated to the needs of the economic sector. The years 1959–65 saw the greatest growth in the number of such full-time employees studying part-time. Whereas in 1940–1 they had constituted 31 percent of all students and in 1960, 52.4 percent, in 1965–6 they constituted 61 percent (15 percent in evening programs, 46 percent in correspondence programs). From 1964 less emphasis was placed on the employment prerequisite (in 1988, only 19 percent of full-time students had worked at least two years), and the proportion of full-time students increased. In 1987–8 they constituted 53.3 percent, whereas evening students constituted 10.4 percent and correspondence students, 36.3 percent. Concurrently, the disadvantage experienced by rural youths grew markedly. In 1969, for example, only 16 percent of all USSR students were from collective farms, whereas 39 percent were from the urban working class. Because in Ukraine almost half of all Ukrainians live in rural areas, that disadvantage could also be viewed as ethnic discrimination. It was reflected statistically: whereas in Soviet Ukraine for every 10,000 inhabitants there were 47 students in 1940, 54 in 1950, 97 in 1960, 170 in 1970, and 166 in 1988, the corresponding numbers in the Russian Soviet Federated Socialist Republic were 43, 77, 124, 204, and 190. Discrimination could also be seen in the way stipends were distributed in favor of the privileged social strata. Of all students in Soviet Ukraine, 48 percent in 1928, 78.6 percent in 1936, 80.5 percent in 1958–9, and 79 percent in 1988–9 received stipends. Of the total number of stipends granted in the Union of Soviet Socialist Republics in 1988–9, 17.3 percent were allotted to students in Ukraine, but 56 percent to students in the RSFSR. A large proportion of Ukraine's students (33.4 percent in 1988–9) lived in near poverty in student residences. In the Soviet period the number of postsecondary students in Ukraine grew considerably. The growth was not a balanced one, however. The first significant increase, from 57,526 students in 1927 to 97,500 students in 1933, occurred because fulfillment of the First Five-Year Plan required a considerably larger number of educated cadres. Further growth was constant (with the exception of the wartime years 1941–4 and those immediately following), but it took place at the expense of the development of correspondence and evening studies. The number of students in Ukraine more than doubled between 1960 and 1980, but from 1980 it declined (see table 2 and table 3). The percentage of female students increased from 10 percent before the Revolution of 1917 to 29.9 percent in 1925, 38.1 percent in 1936, 41.7 percent in 1960, and 55.2 percent in 1987. The ethnic composition of Ukraine's students did not correspond to that of Ukraine as a whole. Jews (in the 1920s and 1930s) and Russians (in the postwar period) constituted disproportionately large percentages of the total number of students in relation to their weight in the total population (see table 4). That the USSR Ministry of Higher and Secondary Special Education discriminated against ethnic Ukrainians in regard to admission to postsecondary schools can be shown statistically. In 1965, for example, for every 10,000 inhabitants in the Union of Soviet Socialist Republics there were 127 Ukrainian students and 174 Russian students. In Ukraine there were two graduate students for every 10,000 inhabitants, whereas in the Russian Soviet Federated Socialist Republic there were four. Ukrainian students were also subjected to Russification pressures. Outside Ukraine and in most cases, within Ukraine students could write entrance examinations only in Russian, and most teaching in Ukraine's postsecondary schools was conducted solely in Russian. After graduating, many Ukrainians were sent to work in other republics, and graduates from other republics were sent to Ukraine. In 1984–5, 576,300 students in Ukraine, or 66 percent of all students there, were ethnic Ukrainians. An additional 134,400 ethnic Ukrainian students (20 percent of all ethnic Ukrainian students in the Union of Soviet Socialist Republics) were studying in other republics, primarily in the Russian Soviet Federated Socialist Republic. In 1971–2 there were 6,084 foreign students in Ukraine: 3,451 from communist countries (1,423 from North Vietnam, 933 from East Germany, 337 from Bulgaria, 260 from Hungary, 163 from Cuba, and 156 from Mongolia); 1,253 from Africa; 1,203 from Asia; 95 from South America; and 82 from noncommunist European countries. Soviet student organizations underwent change. In the 1920s and early 1930s the Central Bureau of Proletarian Students in Kharkiv, attached to the All-Ukrainian Council of Trade Unions, organized congresses and published the monthly Student revoliutsiï. In the 1930s the bureau was abolished, and all student councils came under the direct control of the Party and Komsomol, through such agencies as the Student Division of the Antifascist Committee of Soviet Youth (1941–55) and the USSR Student Council (since 1955). Student membership in the Komsomol increased from 18.2 percent in 1928 to 32.6 percent in 1935 and 95 percent in 1974. Students in the USSR had no independent organization or periodicals, with the exception of the Moscow journal Studencheskii meridian. As under tsarism, Soviet students, particularly those at special institutes, wore uniforms, until the late 1960s. From the late 1950s they were assigned additional tasks, such as working during summer vacations in ‘voluntary’ student brigades, especially in Soviet Asia (eg, building the Baikal-Amur Trunk Railway and working Kazakhstan's ‘virgin lands’). The voluntary scholarly, sports, and other mass associations that students took part in were closely monitored by Party, trade-union, and Komsomol organizations and the administrations of individual schools. Student clubs at individual schools (eg, Kyiv's Hlobus club) co-ordinated the activity of various sports, travel, art, drama, music, and atheism circles and sections. Over 25 percent of all students belonged to different student research societies, worked in design offices, and took part in republican and Union competitions. In 1957 the all-Union Burevestnik voluntary student sports society was created. In 1984 it claimed to have 560,000 members in Ukraine (see Burevisnyk). Many, if not most, students were dissatisfied with the sanctioned forms of student activity and spoke out against being sent to do ‘voluntary’ summer work. From the 1960s those who studied in Kyiv and were involved in the dissident movement organized annual gatherings in May at the Taras Shevchenko monument in Kyiv. In the 1970s they published the samvydav journals Postup (editor Zorian Popadiuk) and Koryto. Those who became involved in the dissident movement and ‘clubs of creative youth’ suffered expulsion, persecution, and even imprisonment. Students at Lviv University, in particular, were victimized in 1973. That year a secret directive instructed schools in the western oblasts not to accept more than 25 percent of its students from among the local population. Beginning in 1988, Ukrainian students founded independent, noncommunist organizations (eg, the Association of Independent Ukrainian Youth in Lviv, Kyiv, and Bukovyna, the Association of Ukrainian Youth in Kharkiv, the Hromada society at Kyiv University, and the Student Brotherhood at Lviv University), initiated the revival of the Plast Ukrainian Youth Association, and joined en masse the Ukrainian Language Society, the Popular Movement of Ukraine (Rukh), the Zelenyi Svit Ukrainian Ecological Association, the Lev Society, and other neformaly and new political parties that promoted the Ukrainian language as an official language, de-Russification, democratic and national rights, Ukrainian independence, and cultural and environmental protection. Many students were allowed to study in the West. Ukraine's student cohort became a political force to be reckoned with. From 2 to 17 October 1990, for example, a large group of students held a ‘camp-in’ and hunger strike in the center of Kyiv. Two weeks into the strike, 120,000 students in Kyiv walked out of their classes to show sympathy with the strikers. The strike ended only after the Communist majority in the Supreme Soviet of the Ukrainian SSR agreed to discuss the students’ demands. Those included removing Vitalii Masol as chairman of the Supreme Soviet, not signing the new, Kremlin-sponsored Union treaty, transferring all CPSU and Komsomol property in Ukraine to organs of local government, allowing military service outside Ukraine only on a voluntary basis, and holding a referendum on new elections to the Supreme Soviet. Soon after a Union of Ukrainian Students was formed. In October 1992, the union organized another hunger strike in Kyiv, but failed to achieve its goal of convincing the Ukrainian government to leave the Commonwealth of Independent States and to call new national elections. Ukrainian students in the postwar West. In the years 1945–51 around 2,000 Ukrainian displaced persons in Germany, 500 in Austria, and 200 in other Western European countries pursued higher educations. The main center of émigré activity, Munich, where the Ukrainian Free University and the Ukrainian Technical and Husbandry Institute were re-established and the United Nations Relief and Rehabilitation Administration (UNRRA) University was founded, had 800 Ukrainian students. Innsbruck had 250, Graz 200, Erlangen 170, and Regensburg 120. Many students took part in the political conflicts and rivalry between the OUN (Bandera faction) and OUN (Melnyk faction), and only in 1947 did the Central Union of Ukrainian Students manage to reunite the 31 social, political, and religious student organizations existing after the Second World War. Organizations founded or revived in that period include the Melnyk-faction Zarevo Ukrainian Student Association, the Bandera-faction Ukrainian Student Organization of Mikhnovsky, the Obnova Society of Ukrainian Catholic Students (est 1930 in Lviv), the Alliance of Orthodox Students, the National Union of Ukrainian Students in Belgium, the Representation of Ukrainian Student Societies in Austria (PUSTA), and the Association of Ukrainian Students in Paris. New student clubs were founded in Heidelberg, Hirschberg, Frankfurt am Main, Aachen, Stuttgart, Augsburg, Freiburg, Salzburg, Innsbruck, Leuven, Madrid, Rome, Switzerland, and England, and the number of periodicals in the Ukrainian student press increased. Most students lived in the poor conditions of the UNRRA and International Refugee Organization camps and the Ukrainian student residence in Munich, and received financial support from the Ukrainian Students' Aid Commission. Most Ukrainian refugees completed their studies and emigrated to North America and Australia in the late 1940s. By 1950 there were only 660 Ukrainian students at West German universities. A new period in émigré student life began in the 1950s. Postwar Ukrainian refugees in the Americas and Australia pursued and completed postsecondary degrees, as did Ukrainians already born on those continents, and founded branches of existing émigré student societies and new university clubs. With the creation of five umbrella organizations—the Federation of Ukrainian Student Organizations of America and the Ukrainian Canadian Students' Union in 1953, a central federation of Ukrainian student societies in Australia (active from 1959 until approximately 1968), and the Union of Ukrainian Student Societies in Europe and Union of Argentinian-Ukrainian Students in 1963—the co-ordinating function of TseSUS was by and large eclipsed. Since the 1960s, Ukrainian student organizations in the West have consisted overwhelmingly of people born and educated there, for whom local and national issues are much more relevant than ideological differences. Since the 1970s the defense of Soviet dissidents and political prisoners and national and democratic rights in Ukraine, and the preservation and development of the Ukrainian identity, language, and culture in both Ukraine and the host countries, have been key issues for the more politicized and radicalized members of student organizations, particularly in Canada and the United States. Certain student periodicals—particularly Student in Canada (1968 to late 1980s), New Directions in New York (1970–4), Vitrazh in London (1977 to early 1980s), and Apprendre ou à laisser in Paris (1977–80)—have offered alternative views and criticized the émigré status quo and nationalist politics. Ukrainian students in postwar Eastern Europe. In Czechoslovakia, Romania, and Yugoslavia indigenous Ukrainian students did not have their own organizations. They were, however, active in national student and Ukrainian umbrella organizations there and organized unauthorized gatherings and events. Such was the case also in Poland until 1981, when, in the wake of the Solidarity movement, Ukrainian students tried but failed to gain official recognition for an independent, self-governing organization, the Association of Ukrainian Students in Poland (SUSP). They succeeded, however, in getting the Ukrainian Cultural Section officially registered as part of the Socialist Union of Polish Students in Olsztyn voivodeship. Since that time Ukrainian students in Poland have championed Ukrainian cultural and minority rights and organized youth fairs, hiking camps in the Lemko region, folk-music festivals, and the restoration of Ukrainian churches and cemeteries. In 1984 they initiated the creation of the General Polish Cultural Council of National Minority Students within the Union of Polish Students and began publishing the council's organ, Zustrichi, in Warsaw. In October 1989, students in Gdańsk initiated the creation of the Union of Ukrainian Independent Youth, linked up with new fraternal organizations in Ukraine. In 1990, after the ‘velvet revolution,’ Ukrainian students in Prague organized themselves into the Ukrainian Studies Student Society (SUT). The society's primary aim is to enrich and further Ukrainian studies; its activities have consisted mostly of organizing lectures, especially by scholars from outside Czechoslovakia.